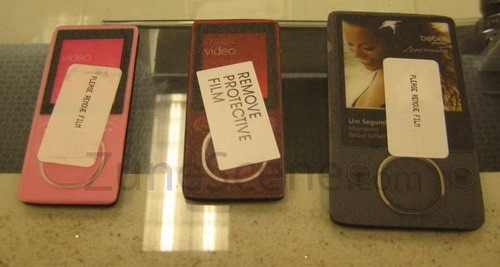 Over in the Zune Scene forums, the "Zune Spy" that works at a big-box retail store has posted a higher resolution image of the forthcoming Zunes. The hard drive-based unit on the far right looks a fair bit thinner than the v1 Zune. It's hard to say for sure of course without having a side-angle view, and maybe these are just cardboard mock-ups that don't map to the same physical dimensions as the real thing, but if you look at the angle of the edge, it looks iPod-esque thin. Wouldn't that be great if the Zune wasn't as chunky? I've seen some people say that there's only going to be one colour for the hard-drive based player: that's possible, although it would be unfortunate for the Zune team to make so many cool colours and designs for the v1 Zune and have it all go away for just a single black Zune. If there has to be one colour, black is the best choice. I find it hard to believe, however, that the Flash-based Zunes are going to be only sold as either pink of brown. That would be...horrible. I'm not one of those brown-bashers, I think it looks quite good, but I didn't buy the brown Zune for myself, so if the only choices are brown and pink, that would be a very bad thing. I can't believe the Zune team wouldn't also have a black and/or white option in there as well. The "squircle" looks decent - hopefully it's not awkward to use. The buttons looks like they're some sort of soft-touch implementation - not quite touch-sensitive buttons, but not quite the manual clicker buttons. It seems like the launch is very close, so stay tuned! UPDATE: Kostas Tzounopoulos from Zune-Online was kind enough (thanks man!) to drop us an email with a link to his Flickr gallery with the really-for-real high resolution (5 megapixel) images. Check out this high-res image to see the mock-ups in all their mock-glory. There's nothing like 5 megapixels worth of blurred pink Zune!